It is easy to target a minority. History, unfortunately, is full of such examples. We are seeing one of the extreme cases unfolding in Pakistan. Just recently, a bunch of religious "scholars" got together to celebrate the 39th anniversary of the second amendment to Pakistan's constitution - the amendment that officially declared Ahmadis non-Muslims. There once was a time, when an imam or an a'lim was expected to talk about compassion, charity, and other actions that could potentially help fellow human beings. But not today - at least not the ones that were gathered in Lahore. The "scholars" that were celebrating the second amendment primarily offered provincialism, scorn, and hate. It is a shame that their interpretation of religion has left them with this sad and tragic courses of actions. 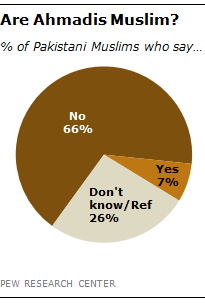 But they are also being egged on by a majority of Pakistanis (see the Pew survey results below). Several clerics called for further persecution of the Ahmadi community at conferences held on Saturday night to mark the 39th anniversary of the passage of the Second Amendment, which declared Ahmadis to be non-Muslims. The speakers branded Ahmadis enemies of Pakistan, called for their social and economic boycott, and demanded that they be banned from taking up any government or military jobs. At the Markazi Khatm-i-Nabuwat Conference in Johar Town, Ruet-i-Halal Committee Chairman Mufti Muneebur Rehman said that he and his followers were prepared to make sacrifices for Khatm-i-Nabuwat. He alleged that Ahmadis were involved in “suspicious activities” and “serious measures” were needed against them. Dr Amir Liaqat Hussain, of Geo TV fame, defended Pakistan’s blasphemy laws. He said that the Ummah needed to unite in support of the laws. He said that they would not allow any amendment to the laws. Maulana Muhammad Azam Naeemi said there was a need to mobilise the common man against Ahmadis. Maulana Raghib Hussain Naeemi termed Ahmadis and their leaders “stooges of the West”. Pir Muhibullah Noori, caretaker of Baseerpur, said that Ahmadis should be banished from Pakistan. He told the audience that if they truly loved the Prophet Muhammad (peace be upon him), they would not let Ahmadis live their lives freely. Allama Raza-i-Mustafa said Ahmadis should be chased till death. So the love of Prophet Muhammad (pbuh) translates into not letting Ahmadis live lives freely! And if "Allama" holds any meaning, the latter is openly calling for the killing of Ahmadis (a genocide?)! Note that this is being reported in a mainstream newspaper. Justice (retired) Mian Nazeer Akhtar said that the time for speeches against Ahmadis was over and it was now time to do something practical. He said everyone should play their role against Ahmadis to tighten the noose around them. 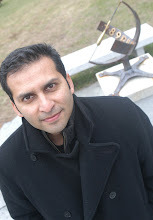 The participants in the conference passed a resolution demanding a ban on Ahmadi publications and legal action against their publishers; the removal of all Ahmadis from government jobs; government-sponsored celebrations of September 7 at a national level; and for the introduction of a new oath of office for holders of important posts affirming that the Prophet Muhammad (pbuh) was the last prophet. The 26th annual International Khatm-i-Nabuwat Conference, organised by the International Khatm-i-Nabuwat Movement, was held in Chenab Nagar, whose population is mostly Ahmadi. The speakers at the conference made derogatory remarks about Jamaat-i-Ahmadia leaders and blamed them for terrorism in Pakistan. Jamiat Ulema-i-Islam (JUI) Secretary Maulana Abdul Rauf Farooqi said it was time to pounce on Ahmadis. He called them apostates and said that they deserved “extreme steps”. Allama Muhammad Younas Hasan said that a “massive search operation” should be launched across the country to identify all of them. He said that he and his followers were willing to make “any sacrifice” for their cause. He said all sects of Islam were united in their opposition to Ahmadis. He said that Muslims should boycott Ahmadis socially and economically to make it harder for them to live in Pakistan. Maulana Qari Shabbir Ahmed Usmani said that the struggle against Ahmadis would continue “till its logical end”. He said all Ahmadis and their leaders should convert in order to gain Allah’s blessings. Maulana Asadullah Farooq demanded a ban on Ahmadis joining the armed forces as they were “traitors”. Read the full article here. This is not just shameful, but here we are looking at the calls for severe persecution and extermination of a group based on their religious identity. We should not be witnessing something like this in the 21st century. Now Pew didn't ask the question, but I'm wondering what fraction of the 66% would go along with the calls for persecution of Ahmadis. Perhaps, it is good that the Pew survey didn't ask that question as I fear the numbers would be too depressing. Thanks for posting this here, Salman. It seems so odd to live in a country where every day we have similar incidents. Apart from the Ahmadis - who suffer under the worst law here - we have Shias getting killed, Agha Khani Jamaat Khaanas attacked. It's terrible. I hope someone will come and put a stop to this, though it seems unlikely with PML-N & PTI "negotiating" with the Taliban. And yes, the targeting of all sorts of minorities is just so tragic and destructive for the society. The targeting shia doctors (and others) has been going on since the 80s. Hello, I love reading through your blog, I wanted to leave a little comment to support you and wish you a good continuation. Wishing you the best of luck for all your blogging efforts. This website has very good content. So I am sure this website will form the well-known in the future. It is not understandable why minorities feel insecure under a religious government.They should remember that Islamic government can better look after them.